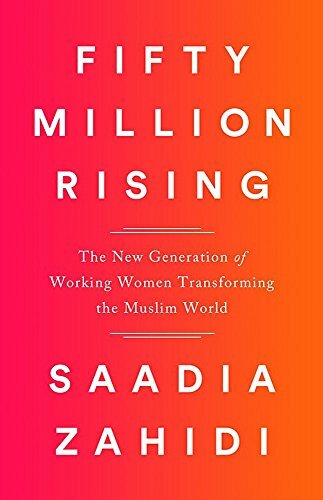 In Fifty Million Rising: The New Generation of Working Women Transforming the Muslim World Saadia Zahidi provides a welcome corrective to the dominant mage of “the tired story of the downtrodden women of Islam.” She acknowledges in fact a deliberate focus “on a segment of women in Muslim societies for whom a largely positive economic story is unfolding” who are not only highly educated, but are also helped to balance careers and motherhood by a strong extended family structure, and the availability of “help” with the children, either from women in poorer segments of the same society, or by import from outside. A key part of Zahidi’s credo as an economist is that “economics trumps culture,” and she shows how patriarchal norms and political decisions lag behind economic realities. For “economics to drive cultural change,” however, she sees it essential to follow what she calls “the Third Way” by which men “allow” women into education and public workspaces, and women find ways to maintain their traditional role in the home along with their new careers. Zahidi maintains that especially for lower income, more conservative households, the Third Way “is the most sustainable path toward gender equality, unleashing change at a pace that society can absorb and laying the groundwork for a bolder stance by the next generation of women.” The main beneficiaries of the Third Way would appear to be the patriarchs themselves of course, who have had to make relatively little adjustment to having a dual income family, though there are some reports of men feeling humiliated if they are no longer sole providers. Most of them seem to cope. By her own admission Zahidi loves data (as well as economics), and the book examines data from 30 countries “in particular” which have at least 60% Muslim citizens, populations over one million, and an average annual income of US $1,025 or higher. This is a diverse group from the oil-rich Arabian Gulf countries, through upper-middle-income countries e.g. Malaysia, Turkey, Tunisia; countries in the lower-middle range including Pakistan, Egypt and Bangladesh, to the lower income economies of Afghanistan, Mali and Niger. As she shows “a quiet but powerful tsunami of working women has swept across the Muslim world” amounting to an estimated 155 million with another 50 million working women anticipated by 2025. Zahidi combines insightful economic analysis with a number of detailed profiles of working women—successful business women, government officials, and white collar workers, and entrepreneurs for whom digital technology has opened up undreamed of opportunities to combine home and career. She interacts with 30 women in-depth in the course of the study and the portraits she paints are usually very vivid, though in the latter chapters the presentation of anecdotal information from so many countries becomes somewhat scattered and unstructured. It would have been interesting perhaps to develop profiles of several women occupying different rungs of the economy in the same country in order to lay bare more completely the dynamics of change. And perhaps more data on men’s reaction to the tsunami would have been interesting though she shows that shrewd business men are welcoming to women with purchasing power, as well as to women with advanced university degrees and business acumen. Gender equality is good for business, and it is the “ministers and mullahs” who need to get on board. This is an excellent publication that provides enough food for thought, and data for further detailed treatment by Zahidi and interested others, of the many interesting challenges these countries still face, challenges not peculiar to the Muslim world though appearing there in some cases in more acute form given the traditional position and expectations of women.